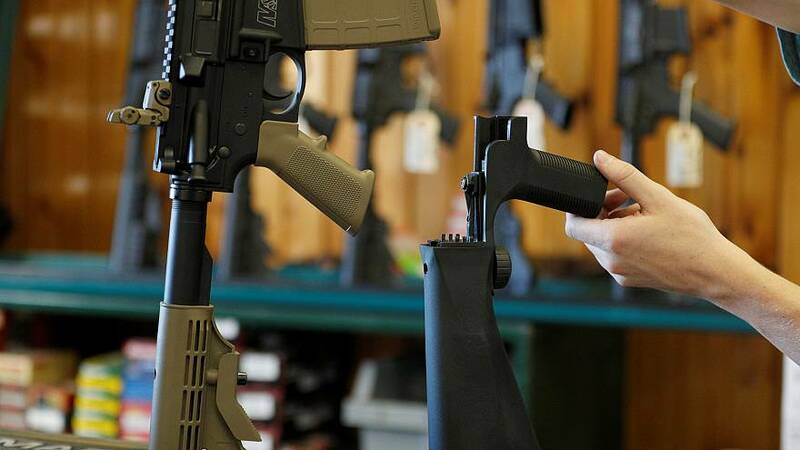 WASHINGTON — Owners of bump stocks — attachments that allow rifles to be fired rapidly — are hoping a federal appeals court will relieve them of the legal duty to destroy the devices by Monday. The Trump administration ordered a ban on bump stocks after they figured prominently in the 2017 Las Vegas mass shooting that killed 58 people and wounded 500 others. A police investigation revealed that Stephen Paddock, who carried out the massacre, had 22 semi-automatic rifles with him in his hotel room overlooking an outdoor concert that he attacked, and 14 of the weapons were equipped with bump stocks. Under a federal rule that took effect in December, owners must destroy their bump stocks, which are usually made of plastic, by Monday or risk prosecution for a felony. The rule suggests smashing them with a hammer, cutting them apart with a saw, or turning them over to a local ATF office. It applies to individual owners, dealers, wholesalers and manufacturers. Federal authorities estimate that half a million of them have been sold in the U.S. The devices are attached to a rifle in place of the normal stock, the end piece that sit next to a user's shoulder. Once in place, the bump stock absorbs the weapon's recoil and alters the relationship between the trigger finger and the weapon. Without a bump stock, the rifle remains stationary, and the trigger finger must be moved to fire each round. With a bump stock, after the trigger is pulled once, the recoil begins moving the trigger against the finger, which remains stationary, resulting in rapid firing like a fully automatic rifle. For that reason, the Trump administration concluded that bump stocks violate a federal law that bans machineguns, defined as weapons that automatically fire more than one shot "with a single function of the trigger." Gun rights groups sued, arguing that bump stocks are intended to be used with AR-15 style rifles which are mechanically incapable of firing more than once with a single function of the trigger, because it must be released and moved again to allow the weapon to fire. They say the words of the statute — single function of the trigger — refer to the movement of the trigger itself, not whether the trigger is pulled by a finger or actuated by a bump stock. "The government is just wrong to focus to focus on the behavior of the person rather than the function of the trigger," said Erik Jaffee, representing the gun owners. "Function of the trigger means the trigger, not the shooter." The Justice Department told the U.S. Court of Appeals in Washington, D.C., on Friday that the courts have interpreted the phrase "single function of the trigger" to mean "single pull of the trigger." A bump stock, government lawyers argued, allows a rifle to fire automatically once the trigger is pulled once, and that qualifies it as a machinegun. An ATF spokeswoman said some owners have already turned in their bump stocks. But gun owner groups said others were waiting to see whether the appeals court agrees to put the rule on hold. The court did not indicate when it might rule.